Expressive abstracts, sensuous flowers, expansive skies and red hills — these and other images flowed from Georgia O’Keeffe’s brush after she was inspired by a new approach to art. Once her work caught the attention of modern art impresario Alfred Stieglitz, the rest was history. Anna Koster served as Georgia O’Keeffe’s weekend companion and saw the famous artist’s life firsthand. Anna shares insights into O’Keeffe’s art and life and demonstrates techniques O’Keeffe used in her art. Anna worked for the famous artist in 1976, then went on to earn an MFA degree and enjoy a long museum career. Learn more about Anna and O’Keeffe at www.annakoster.com. 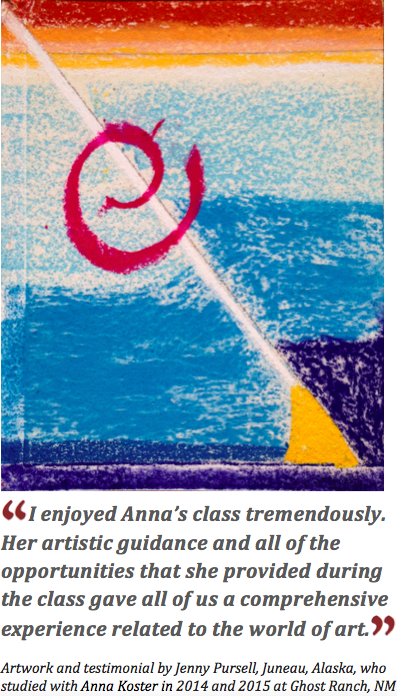 ​Try the same exercises that liberated O’Keeffe and gave distinctive voice to her work. The practices that led O’Keeffe to express herself can guide you in finding your inner aesthetic and authentic expression. Join us and discover your own artistic vision. Ideal for beginners, good for experienced artists who want to try a fresh approach: All skill levels are welcome. Learn more at www.annakoster.com. - If you already have supplies, bring your preferred color media. - Otherwise, buy Prismacolor NuPastel Color Sticks (any size set), 9x12-inch Strathmore Pastel pad series 400 (or other drawing tablet), and a kneaded eraser. Optional: blending stumps (also called tortillas), Krylon Workable Fixatif (or other fixative). ​- If you purchase at University Art, San Jose, ask for the 20% student discount. - If you have questions, email me through my contact page.